Friday, August 26 marked the grand opening of the new student-run business “Boulevard Record Shop” on Belmont Boulevard. The store moved into the previous location of BLVD Music. The Boulevard Record Shop features an inventory of both new and used records in all different genres, record players and musical instrument accessories. If a customer is looking for a particular record that the shop doesn’t have in store, he or she can fill out a slip with the album’s title and band name and the shop will order it in. The store also sells Switters brand coffee. 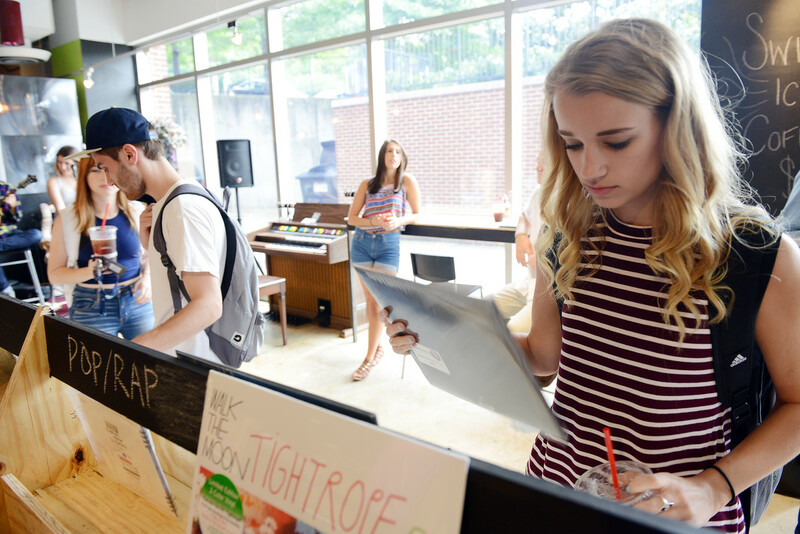 In addition to the store’s items for sale, Boulevard Record Shop features two listening stations that allow students to listen to any record while they sip their coffee. There is also a stage set up for live music events that are planned to take place in the evenings. Senior music business major Jacee Badeaux is the manager of the shop and hopes its atmosphere will appeal to both students and non-students alike. “My favorite part of Boulevard is that it is a great space for everyone to use. Whether you are a freshman, senior or don’t even go to Belmont, you can feel comfortable here,” said Badeaux. Boulevard Record Shop is open Monday through Saturday from 11 a.m. to 7 p.m. and is closed on Sundays. For more information on the shop’s location, events and new arrivals, check out its website.